CaryAli pursues Scandinavian vistas worthy of Odin himself. 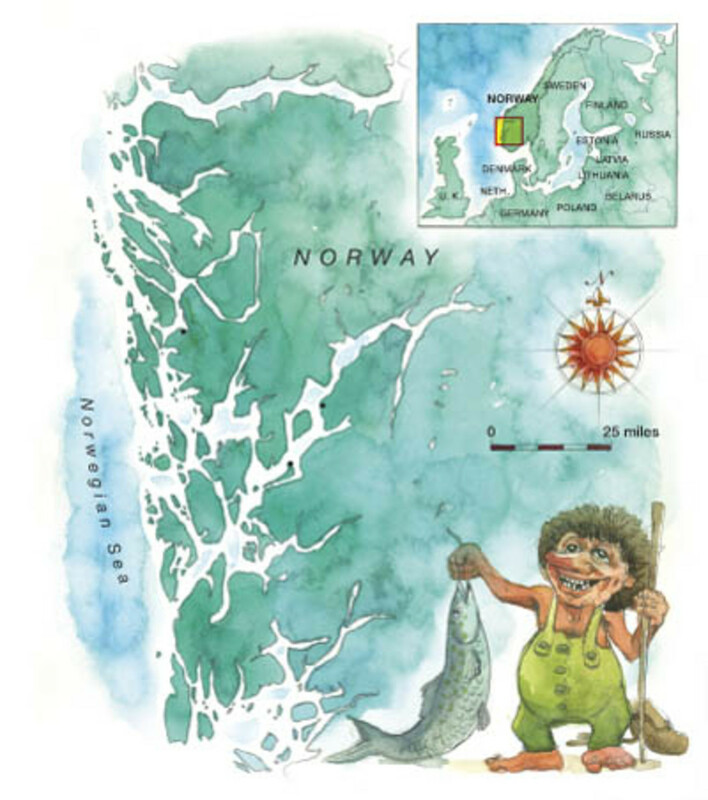 To begin preparing for a trip to Norway, I checked the weather (cool and rainy) and the charts (much farther north than I’d thought). But the most interesting part of my pretrip research was discovering that all the Scandinavian pop-culture references I could think of were Swedish. Ikea? Swedish. Stieg Larsson? Swedish. Even the chef on the Muppets was Swedish. All I was left with was trolls and Vikings. 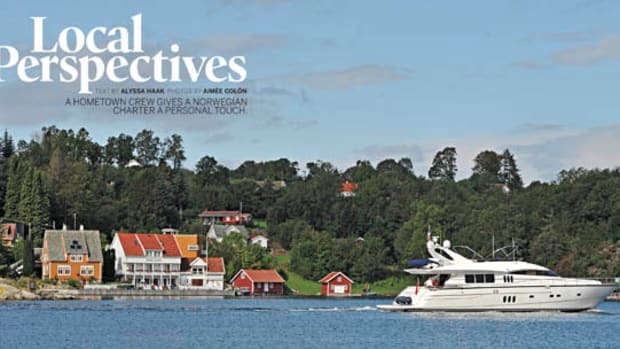 Fortunately I’d be cruising Norway’s fjords aboard the first Nordhavn 86, CaryAli so I’d be able to see the country from a more intimate perspective. 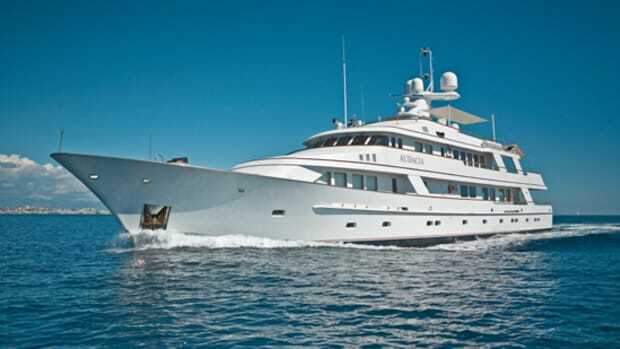 Combining Nordhavn’s renowned seaworthiness with the trideck luxury of a mini megayacht, CaryAli was sure to protect us from the cold and those trolls. Our party landed in Norway on a Wednesday. In Norse mythology, Wednesday was named for the father of the gods, Odin. (Etymology indicates that Odin could also be spelled Woden hence Woden’s day or Wednesday.) As the god of the sky, war, magic, and wisdom, his patronage promised to make our cruise through the fjords interesting. But we first had to get onboard. Captain Adam Steel led the way with a quick leap from a commercial dock edged with a short metal I-beam, a structure we’d encounter on other Norwegian docks. But on my first boarding, it was daunting as the beam was damp and slippery from the misty air. Indeed, this particular Wednesday in early September was just one of the area’s estimated 300 rainy days each year. With the midnight sun no longer shining, the weather had turned fickle—overcast and damp one minute, gloriously warm and sunny the next. So photographer and PMY art director Aime Coln, my friend Amy Thomson, and I passed first our bags and then ourselves over what seemed to us to be a crevasse of death, fortunately without incident. 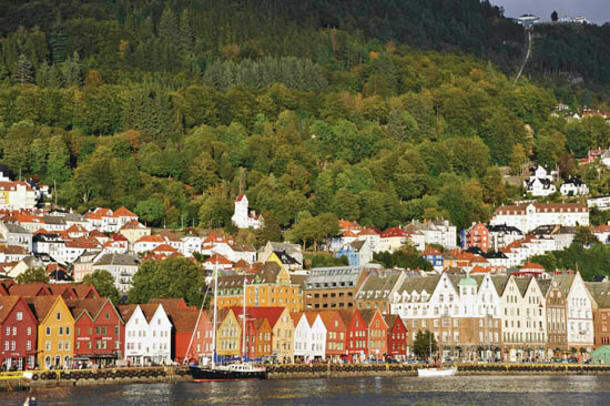 After meeting the crew and quickly settling into our cabins, we set out to explore Bergen, Norway’s second-largest city, with stewardess Amber Steel and mate Ryan Keany. It’s a beautiful old city nestled between two mountains, one featuring a tram that climbs at a 26-degree angle to the top, which would be our first tourist experience. Waiting at the bottom in the small cave that serves as the tram station, I couldn’t even see sunlight filtering down through the clouds. 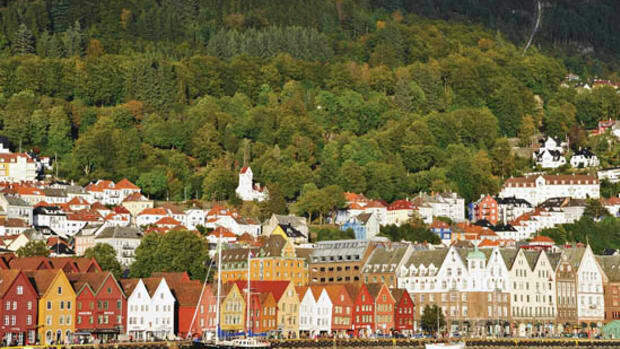 But once we were on top, the city stretched out before us in what we’d soon identify as the colors of Norway: burnt ochre, brick red, and white. Unfortunately our subsequent explorations of the quayside fish market and the UNESCO historical site of Bryggen, with its crooked, timber-supported buildings, were cut short by cold, drizzly rain. But as our silver lining, we were driven back to the yacht for our first dinner of local scallops (caught that morning) with a blueberry salad. Odin had smiled upon us our first day, clearing the skies, and we took full advantage of the warm late-summer sun during our five-hour cruise south through the out islands—skaergard in Norwegian. The number of homes along the coast began to decrease until they eventually became a rare sight. Capt. Adam found a small cove near Harpeskallen that was the perfect place to drop a couple of fishing lines. As soon as the hooks hit the water, Ryan was reeling in a mackerel. No matter who held the rod, the results were the same: a fish at its end. But when I reeled in my catch it turned out to be what I referred to as the “red poison fish of death,” and the captain lunged for gloves and pliers to pry the fish off the hook. 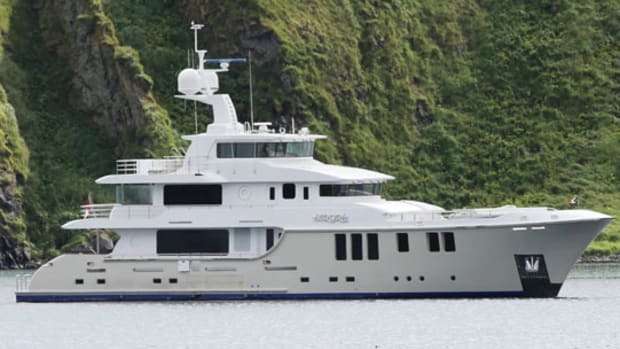 Poison death fish have a way of ruining a perfectly enjoyable afternoon fishing session, so CaryAli soon resumed her cruise through the 600-foot-wide pass of Luksundet, which was topped with a snowy glacier that blended seamlessly with the low-hanging clouds. With its 180-degree views, the helm table was the ideal place to sit and watch the waterway narrow and the cliffs rise around us. 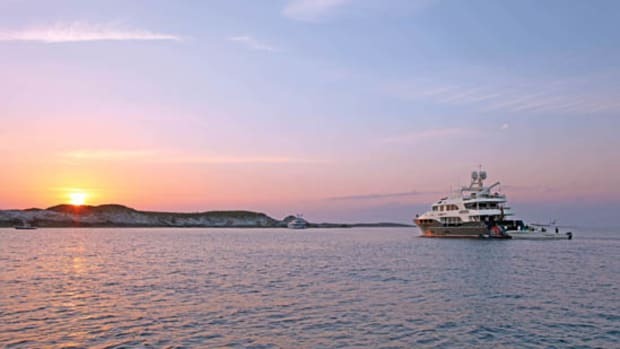 Once we were on the other side of the pass, we anchored between the out islands of Nordya and Terya and the mainland. In the quiet of the afternoon, we had two options to explore: a kayak or the 19-foot Zodiac RIB. Amy, Aime, Ryan, and I tried our hands first at the kayaks, in which we circled the one-house island of Terya. But though Nordya and the shore seemed close, we deemed it more efficient to investigate them by tender. As Ryan piloted the tender close to the cluster of buildings, we could tell they were empty. (Chef Dan Hewison collected wild blackberries and snail shells from the rocks, excitedly referring to them as “delicacies.” I hoped they wouldn’t appear on my dinner plate that evening.) The same was true of the other island: Nordya seemed to be only inhabited by goats. Back aboard Amy and I had stretched out on the sundeck to take in the warm late afternoon sun when Amber suggested we test the hot tub. The water heated quickly, and as the bubbles started to gurgle, we couldn’t feel even a hint of chill in the air. After the day’s activity, Aime, Amy, and I sat down for dinner at CaryAli’s indoor dining table and discovered that the table setting reflected our day’s adventure: Pinecones that Amber had collected surrounded vases of thistles and greens similar to what we’d seen during our walk. Chef Dan had prepared a meal that combined his international experience and regional flavors. It began with small crawfish tails with a side of cauliflower puree topped with a wasabi dressing for a touch of heat—a light start that left plenty of room for the main course of pork tenderloin served over a risotto with a jus of juniper. The next morning the weather turned into what I’d come to expect as the clouds and mist began to gather. While underway to Hardangerfjorden, one of the smaller fjords, we dined on a breakfast smorgasbord of pastries and coffee. 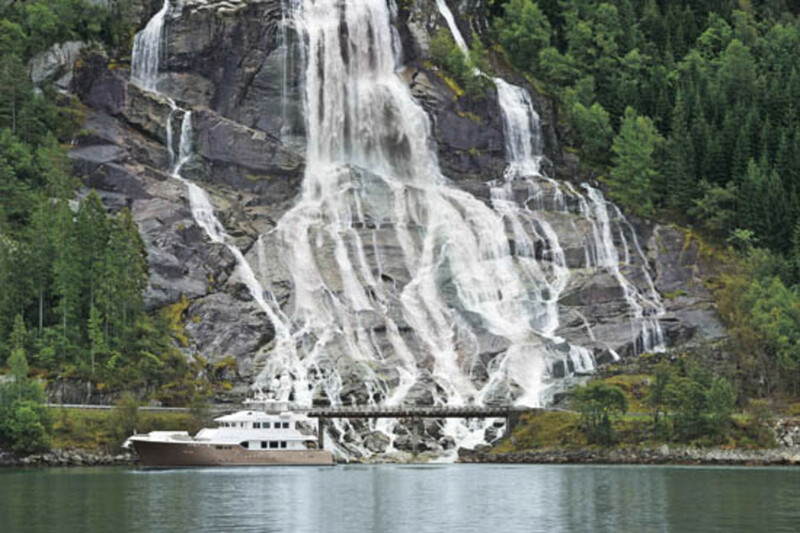 Outside, water from the glaciers trickled down the steep rock faces that surrounded the fjord. Here, we encountered the first town to show signs of life since Bergen: Sundal. But besides a small campground with a few RVs, most of the activity was at the nearby salmon farm where the fish were penned in by nets and skipped across the water on their tails. We spent our last night aboard docked at Rosendal, which we reached just in time to explore the tiny galleries of local artists before they closed. 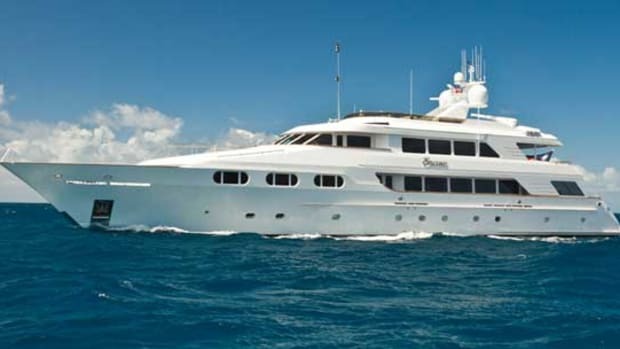 It was dinnertime, and for a change, Chef Dan abandoned his galley for the sundeck grill and the formal dining table for the outdoor one. Despite wind and rain, we were warmed by the heat of the grill and protected from the elements by isinglass as we ate cheeseburgers, lemon chicken, potato salad, and homemade coleslaw. It was a straight shot back at 8 knots to Bergen the next morning. The sunny weather of our first day was just a memory, as the cold intermittent mist had become steady. But Aime, Amy, and I each found a comfortable chair or sofa in the main saloon, each wrapped up in our own blanket, and settled in to watch the islands go by. And as we alternated between reading and looking, the ride was silent except for the soft snap of the rain against the windows, creating the perfect ending to a cruise spent in the quiet Norwegian fjords aboard CaryAli.